Contemporary music has come some distance in the new century and the few decades preceding it. One trend is centered around tonal musics to be had nowadays that aren't doctrinaire neo-romanticism or typically minimalist in a mesmerizing sense, though repetition may be a factor. You can hear some of it in a somewhat unusual release by the women's choir known as The Crossing, conducted by Donald Nally. It's a collection of works entitled I Want to Live (Innova 856). The choir is very good, the soloists quite adequate but the overall ensemble the strongest element. They come forward appealingly in a program of short works, some grouped in multi-part sets, by David Lang (of Bang-on-a-Can fame), William Brooks, Paul Fowler, and Pelle Gudmundsen-Holmgreen. "I Want to Live" is one of five interrelated Lang works, Brooks is represented by "Six Medieval Echoes," Fowler is represented by two short works, and Gudmundsen-Holmgreen by the eight short segments that make up "Statements". The music was written between 1970 and 2010, with the bulk from the present century. There are at times hints of an early music influence (especially the Brooks suite) and a minimalism where recurrence is not as pulse-periodic as it is stanza-like in a more song-like conceptual framework, or gradually unfolding in short bursts of melody. It is music of high interest performed with a gently spirited or more stirring presence as called for. It is a very good example of the "new tonality" to be heard today, helping reserve a rightful place of the style alongside other stylistic currents in new music right now. It is a very good listen in any event, atmospheric and evocative, sometimes overtly emotive but consistently introspective-atmospheric. There are genre bending, category conflating, creative hybridizations out there to be heard these days. Some do what they do very well. Others don't quite manage to make it all hang together. 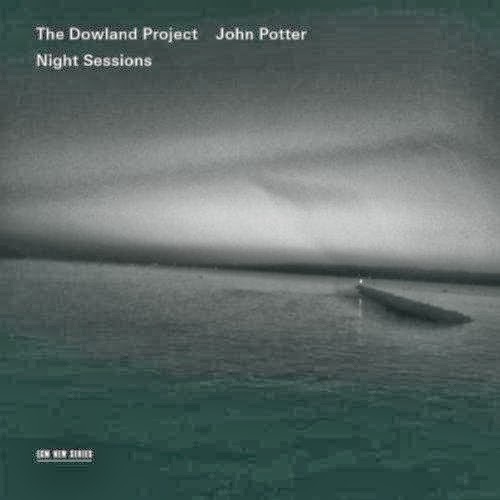 John Potter and The Dowland Project is most definitely the former kind of gathering. They combine Dowland era vocals and lute music with adventurous free improvisation, old English poetic recitation and a very keen sense of stretching that works fully. Their recent album Night Sessions (ECM B00 18701-02) came about as a result of an extemporaneous nighttime recording session after the group had completed what eventually became the album Care-charming Sleep. The unplanned nature of Night Sessions gives the music a special spontaneity. Who are The Dowland Project? The center of it all rests with John Potter, talented vocalist. He was a long-time member of the famed Hilliard Ensemble and brings a great deal of early music expertise and artistry to the ensemble. Then there is Stephen Stubbs, a lutenist of skill and finesse, player of the baroque guitar, chitarrone and vihuela. Further and critical are the presence of two major figures in open-form jazz today, John Surman on soprano saxaphone and bass clarinet, and Barry Guy on double bass. Rounding out the group is the important inclusion of a two-person violin section of Maya Homburger and Milos Valent (the latter also on viola), creative improvisors and bringers of early and rustic stylistic echoes from a time long gone. What is uncanny is the range of combinations the group achieves here. 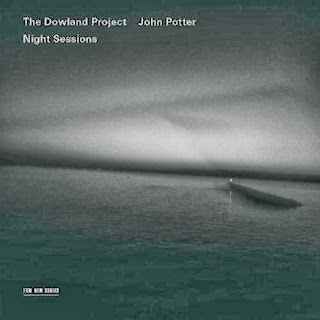 From straightforward lute music and lute-vocals characteristic of Dowland's era to such sounds with freely tonal improvisations woven around it, improvised or loosely articulated estampies and the like, and then there are completely idiomatic modern free improvisational expanses, sometimes with John Potter dynamically reciting texts of the earlier period, sometimes fully instrumental. Somewhere in between are very free early style vocalizations with very open improvisational interactions. Barry Guy is inspired. John Surman, too. The whole band was lucid that night. John Potter holds it all together. Successful interpenetrations of this sort do not happen often. This session comes through with unique character, a kind of stylistic homogenization that no doubt comes out of musical sympathy and a mutual, intuitive understanding of where and when to push back boundaries and how far to do so. A marvel, this one is. Those that know and love early music will find a way into modern improvisational approaches; those in the latter camp will find the combination with the venerable quite bracing. It's the sort of musical event that's very suitable for anyone who wants a different listening experience. Such people will find much to stimulate and to open up new mental-aural musical panoramas. Bravo! Bedrich Smetana (1824-1994) and Antonin Dvorak (1841-1904) were instrumental in putting the area now known as the Czech Republic on the map musically. They both combined the prevailing romantic ethos of the time with their own musical personalities and the feel of local folk musics they experienced in their lives. Of all the so-called nationalist composers, they were among the most brilliantly successful in matching real musical inspiration with an internalized musical culture absorbed from the air around them. Paradoxically, Dvorak is most remembered for two works inspired by his visit to the United States, his Symphony "From the New World" and his String Quartet No. 12, "The American." The latter has gotten a fresh new reading by the Tokyo String Quartet, along with Smetana's seminal First String Quartet, "From My Life" (Harmonia Mundi HMU807429). Both works have had deserved popularity for their singingly memorable, expressively lyrical, yet robust thematic material, the clarity of structure and exemplary status as among the best in later romantic string quartet craft. 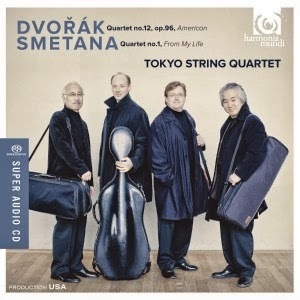 The Tokyo String Quartet give a fittingly impassioned reading of the works--flowing, emotive without erring on the overdone side, beautifully phrased and balanced. These are some of the finest performances I've heard of the two masterpieces. They are very much recommended. 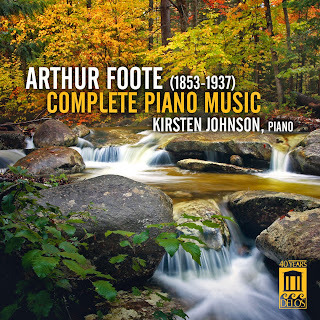 If Arthur Foote (1853-1937) is not known today as the "father of American classical music" it wasn't always the case. He was well regarded during his lifetime, surely a contender for the honorific of founder-figure. By the time of his death the modernists had become a force unto themselves. His music seemed old-fashioned. And eventually Charles Ives' music came to be recognized as both original and foundational. Foote's light had ceased to burn as brightly. Indeed Foote today is not looked upon as a brilliant innovator. He took romanticism and a bit of impressionism and made a very well crafted version of his own. He is not the place to look for the American root source of the music that followed. Yet he bears a hearing. At his best he is a lyrical force that can do much to bring pleasure to your listening. These thoughts have been on my mind as I have listened closely to Kirsten Johnson's three-CD set of his Complete Piano Music (Delos DE 3442). The pieces comprise well over three hours worth of music, from the beginnings of his career to the end. It is a major undertaking. Kirsten Johnson renders the works with sympathy and poetic attentiveness. And as the program unfolded, I found myself responding increasingly to the music. The first works are firmly within a romantic Beethoven-Schumann-Chopinesque tradition. And there are works that sound like pedagogic etudes, studies in arpeggiation and such. But as he progresses there is more and more originality and an expanded sensibility that encompasses some of the impressionist openness. The minor key pieces always seem right, but towards mid-point in his career on, much of the work has an inventive thematic songfulness to it. 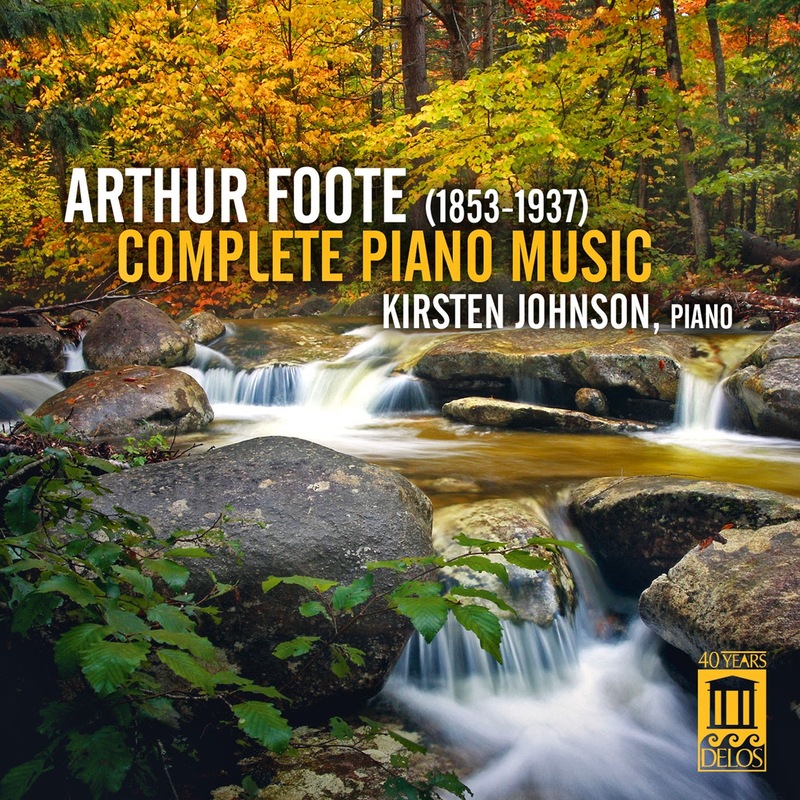 The breadth of the set coupled with Johnson's sincere artistry means that it is for now a kind of last word on Foote the composer of piano works. It provides much to like and a full picture of Foote the artist. In the end you stop caring whether his music was as advanced as some of his contemporaries and you fall under its spell happily. Listen and you'll be taken on a most pleasant journey. This set won't upset the applecart of American musical history, but it no doubt will give you much pleasure if you accept it on its own terms. 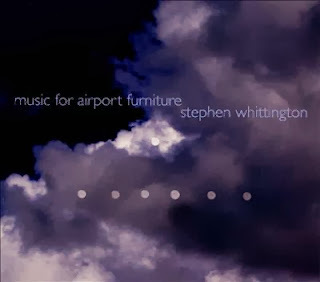 The title of Music for Airport Furniture (Cold Blue 0038), Stephen Whittington's 20-plus minute EP CD single and the work of that name which the CD presents, is a kind of succinct, clever way of the composer to show his stripes, to allude to both Eno's "Music for Airports" and Erik Satie's "Furniture Music," which of course are pioneering works in the minimalist-ambient zone. Whittington's work for strings, played well in this recording by the Zephyr Quartet, owes something to those root works, but in many ways goes in its own direction. It is a long sustained meditation on a pivoting point of a series of alternating lush, close harmonic chordal blocks for the four strings, almost as if some portions of the adagio movement of a late romantic/impressionist string quartet were lingering in the mind, in a hypnagogic or dream state, stitched together imaginatively and stretched to endless sustains, melded together by the selective memory of them, like the afterimage of a bright light in the aftermath of its presence. Like that afterimage it is by no means static. There is recurrence but also development within the slow sequential unfolding. That is what you get on first impression. Repeated listens open up the long structures underpinning the mesmerizing alternations. Parts remind me of Hovhannes's string writing, minus the Armenian roots, but that mostly has to do with the pizzicato punctuations and long sustains common to this work and a few of Alan H's. The music is a kind of lament, gorgeous, reflecting, very gradually revealing itself in a state of profound quiescence. It has great beauty and expressiveness. It sounds much the better after you've heard it a few times and opened up to the sonic universe it inhabits. There's nothing quite comparable to it. It succeeds in slow movement advanced tonal quasi-minimalist territory much more readily than some more well known composers' attempts have. And it does it in a way that delights and moves the musical emotional-cognitive listening apparatus--or mine anyway. Yours too, I would suspect. Dave Brubeck lead a long and productive life and had the kind of success and recognition from a wider audience that very few other jazz artists in his generation attained. That latter fact has lead some over the years to question his artistry, since "popular" and "jazz" if occurring simultaneously tend to be looked upon with suspicion and misgivings, at least from the '50s onwards. Whether he "deserved" the kind of success that Miles Davis also had is probably an unfair question. When Brubeck was alive and in his prime he was a dominant force on the jazz scene. Leaving success aside one can survey and evaluate his career from a more detached perspective today. He was an innovator; even his most popular work left a legacy behind that most certainly influenced others and enriched the music, both in the way he went about improvising on the piano, his small group approach, and his compositions and songs. "The Duke" and "In Your Own Sweet Way" are exemplary masterpieces in jazz form, widely performed since he introduced them in the '50s. And there has always been some incorporation of modern classical harmonies and pianism in his approach, probably stemming from his study with Milhaud at Mills College in his formative years. Milhaud encouraged combinations of classical and jazz. Brubeck responded. And there was always an adventurous strain in Brubeck's music. As early as the Octet days he showed that he was not content to stay within conventional bop and after channels. The '50s were a time when that was more encouraged than it might have been later on, so he wasn't discouraged as far as the public ear went. And Time Out was as influential as it was a popular success. But even more directly he composed modern classical works per se, for performance with classical ensembles of various sorts, with or without the addition of his jazz ensemble. He left behind various recordings of this side of his work and especially as he and his music aged classical ensembles increasingly began performing these works independently. So the CD at hand today is in no way unprecedented. It does however consist of a singular series of songs for choral ensemble and piano, so we are in somewhat special territory nonetheless. The Pacific Mozart Ensemble under Lynne Morrow gives us fine renditions of 19 songs on texts by American poets. 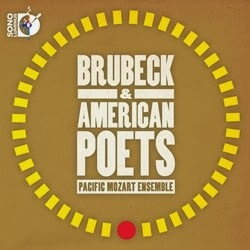 The recording in question is called Brubeck & American Poets (Sono Luminus 92160). Poets like Langston Hughes and other moderns are represented, as well as more traditional bards, but ultimately it is the music itself that comes at you most directly. These are short, through composed songs that sometimes incorporate jazz forms but more often simply come across with a kind of straightforward charm. There is something naive about their often elemental demeanor. They sound like they could be performed without much trouble by high school or college choral groups. But what comes through most is the Brubeck melodic-harmonic personality. Their direct simplicity coexists with some subtle twists and turns, so that a number of listens after the first one you keep finding things you didn't notice the first time coming to the fore of your musical-aural mind's eye. Ultimately these spirited performances and the music they embody will disarm and captivate those who are open to them. They do not represent either the greatest things Brubeck ever wrote nor do they come across as startling new music for the most avid of modern music connoisseurs. They have little in the way of pretension and that in part accounts for their effectiveness. Very nice music. Brubeckians will appreciate, but so will those seeking straightforward, tuneful pleasures. Like many Sono Luminus releases this one comes as a two-disk set: one for standard CD in conventional two-channel stereo, the other a Blueray disk with surround sound mixes. It occurs to me that lute music, Renaissance or Early Baroque, composed by a master and played well, is something I simply never tire of. I suppose that's also true of music for the viola da gamba. Be that as it may I have found much pleasure listening of late to a particularly good collection of solo lute music by the Renaissance master lutenist Francesco da Milano, nicknamed in his day "Il Divino," which sounded a bit much to me until I heard Paul O'Dette's fine recording (Harmonia Mundi). Now I am ready to hail Il Divino as well, at least by a short obeisance in front of my stereo while the CD is playing. I dare say the chances of actually running into the fellow are slim nowadays. But thankfully we have his music. Da Milano was to the Italy of the period the lute composer of choice. 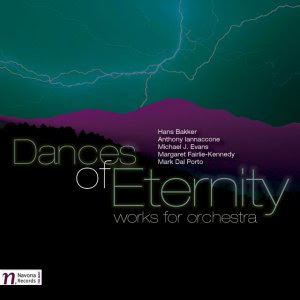 Paul O'Dette has arranged the various works on the album into a series of suites consisting of a ricercar, a fantasia, and one or more Da Milano arrangements of popular songs of the day. It makes the music flow marvelously, not more so though than Maestro O'Dette's beautifully fluid playing. Two-part contrapuntal lute passagework, with which Francesco's writing abounds, is a marvel to hear in Paul O'Dette's hands (and fingers). It is music of high sophistication yet direct charm. 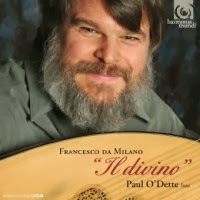 Paul O'Dette and his lute have enchanted me on this disk, and I am sure will continue to do so for many years to come. You should give this one a serious listen. It should grab you whatever your background. New music for orchestra is not in short supply if you know where to look for it. A very good example is the recent release Dances of Eternity, Works for Orchestra (Navona 5907), which features six new music works by five deserving composers. The disk offers adventuresome and solid fare, contemporary without necessarily falling into the outer echelons of the avant garde camp. Hans Bakker gets two of his works performed; Anthony Iannaconne, Michael J. Evans, Margaret Fairlie-Kennedy, and Mark Dal Porto each are represented by one. Without going into the details for each piece (given time and space constraints), all generally have in common a dynamic thrust, suggestions of the dance in their more rhythmic moments, an expanded tonal palette, a good sense of orchestral color and variety, and imaginative tone painting. Each composer has something to offer and the totality of distinctive compositional voices works together for a program of music that gets your attention and keeps it. If you are interested in the new, here is one place to hear some works and composers you might not ordinarily get a chance to sample. Thanks to Navona, you can. The sonics are excellent, performances lively. I recommend you hear it! Cold Blue Music, the avant tonal/ambient label out of Venice, California, has hit on an excellent idea that I hope will catch on. It's the offering of a modern classical CD "single," generally speaking a single work of contemporary music lasting 20-30 minutes. I do believe that if the music is really "new" and the length suits that format that it does help you concentrate and "bracket" that work alone instead of otherwise dealing with a complex set of unrelated compositions grouped together in the standard 80-minute CD. I am not saying that full-length CDs should be done away with, but that the supplementary singles idea is well suited for works that don't necessarily belong together with other works and can breathe more freely on their own. I covered a few Cold Blue EP singles on these pages over the summer. 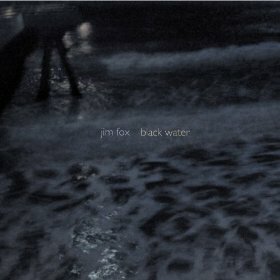 Today another one, this by Jim Fox, entitled Black Water (Cold Blue 0037). The work is from 1984, fairly early in Maestro Fox's body of work, but inimitable nonetheless. The score calls for three pianos, ably played via overdubbing by Bryan Pezzone. It's a shimmering, undulating work with multiple tremeloes and emphatic chordal periodicities building together and evolving to create harmonic-motor movement. There is a flowing yet dense layering throughout that suggests water in motion. The music exhilarates and engulfs the senses in a very satisfying way. And it does so with originality and ambient drive. It is a work better heard than described for its all-over dramatic poeticism. If you do not know Jim Fox's music, and you should, it is a good place to start. And it has a singularity that's well worth experiencing even if you have heard others of his. Anybody musical who is alive and has access to media no doubt realizes that synthesized music has permeated our everyday musical existence to the extent that radio, television, movies and video have a disproportional amount of it--as never before. Sometimes it seems that it threatens to edge out conventional musical instrument ensembles completely, although ultimately that is unlikely. No doubt for this reason some contemporary electronic and electro-acoustic music of a formal sort--classical, avant and such--does not sound new and revolutionary in some automatic sense as it might have in the classic later '50s-early to late '60s period. We have grown used to the modular sounds typical MIDI synths produce. The work of the electronic/electro-acoustic composers of today are situated in a vastly different sonic-cultural environment than was the case then. Perhaps they are more free to extend their sound universes than before, but at the same time they do not get the same amount of exposure that they used to, even if some audiences back then were hostile. Enter Lou Cohen, a veteran Boston-area-based composer who after a long period composing for conventional instruments from the '60s forward has devoted his exclusive attention after 1990 to electronic music. The 3-CD set simply titled Music (Pogus 21071-2) gives us a comprehensive look at his music from 2003 to the present. He has been prolific and the results show an original musical mind at work. Like Xenakis before him he composes using Stochastic mathematical processes and also algorithms. Like Xenakis too the music does not sound especially mathematical, but perhaps it has given Cohen the conceptual means and impetus to create long-formed works that sprawl with grace and intelligence and seem especially continuous and logically unfolding compared to the sort of high-contrast, jab-and-run kind of electronic and otherwise high modern music one has heard over the years. The more than three hours of music covered on the disks has a high sense of purpose and a dramatic impact that varies and cannot readily be summarized in this space. Some have an analogue sound quality, there is some use of organic as well as electronically generation sounds and a Promethean effect is achieved as often through noise pitch complexities as through more musically conventional tones. All comes through as excellent noise and timbre poetry, complex and ever flowing, electronic wizardry of the best kind. 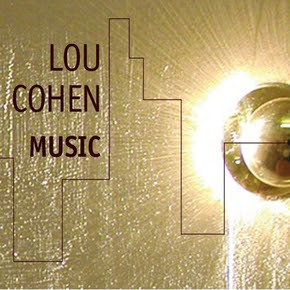 Lou Cohen creates formidable, expressive, impressive essays in sound that are among the best such works being made today. Sadly, I just heard that Maestro Cohen passed away late last month after battling with pancreatic cancer. RIP Lou Cohen. Your music lives on for us to savor, now with a bittersweet regret. Kevin Puts (b 1972) writes music that has a contemporary feel to it yet is very lyric and tonal. 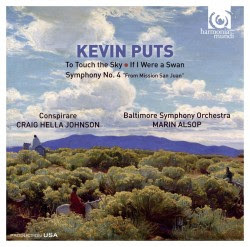 A recent CD gives us a good look at him with three works of substance, To Touch the Sky, If I Were A Swan and Symphony No. 4 (Harmonia Mundi 907580). 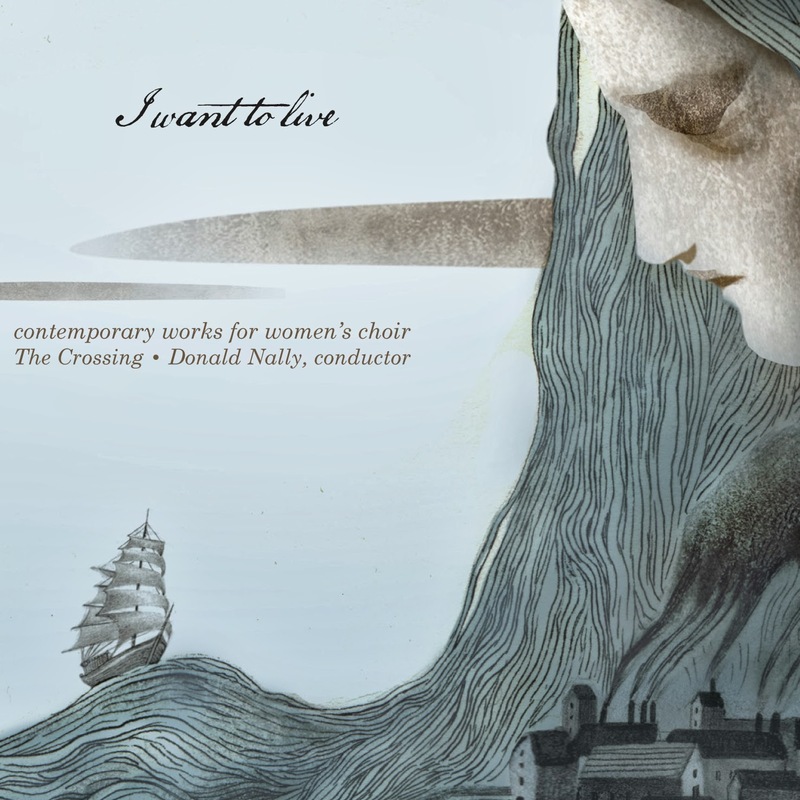 The first two are acapella choral works of singular directness, with rich harmonies and spacious clarity, beautifully performed by Conspirare under Craig Hella Johnson. Text and music mesh together poetically, each paralleling and synchronizing together the pastoral expressiveness with affective evocations. The third, Puts' "Symphony No. 4, From Mission San Juan," is based on Native American themes. Marin Alsop leads the Baltimore Symphony Orchestra in a stirring performance of this full fledged, well crafted work. It has greater contrapuntal and melodic-harmonic heft than the choral works, which is fitting, and feels like the contemporary equivalent of Copland and the Americana school of earlier days, like a contemporary complement with a special Putsian charm, a familiar-seeming yet rather youthfully distinguished voice of its own. These World Premiere recordings give us notice that Kevin Puts has entered a realm of singular personality that will nonetheless have wide appeal to audiences seeking lyrical treasures. The performances realize the subtleties of the scores with a wonderful attention to detail, most especially in the symphony, and a warm enthusiasm, especially in the choral works. Definitely recommended. The Japanese percussionist Kuniko Kato has a way about her. The album Cantus (Linn CKD 432) shows that clearly. It's her alone, on marimba and other percussion, sometimes multitracked to get the full result. She performs Hywel Davies' "Purl Ground" and Kuniko's own re-arrangement for percussion of some Arvo Part and Steve Reich gems--"Fur Alina," "Cantus in Memory of Benjamin Britten," "Fratres," and "Spiegel Im Spiegel" by Part; "New York Counterpoint" by Reich. The respective composers supervised the sessions. 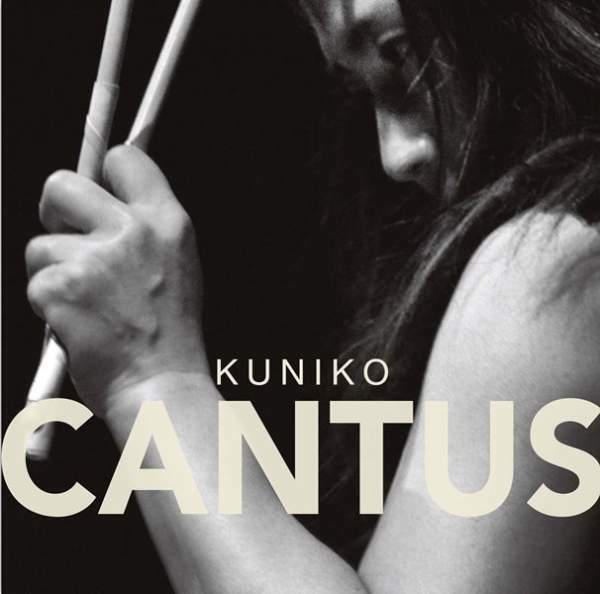 What is especially remarkable about this collection is Kuniko's almost legato approach to the mallet instruments, especially the marimba. Apparently the instruments were not close-miked so that gives the sound a resonance it wouldn't have quite so much out front with typical studio miking. But it is mostly how she plays, laid back and swinging yet not as sharply sounding as typical marimba soloists and ensembles sound, for example on the Reich. She has done a great job with the re-arrangements. There is a sweet spaciousness. Her sound gives the well-known works a new life, as if you are hearing them anew. The Davies work is equally compelling. There is something to me that sounds spatially-cosmically Japanese about her renditions, like a minimalist Japanese house--matter-of-fact yet mysterious in its presence. It's both simple in appearance yet deeply meaningful. Kuniko sounds like that to me. This is one stunning album. Kuniko is a phenomenon and she makes the music her own in sonically moving ways. Excellent! 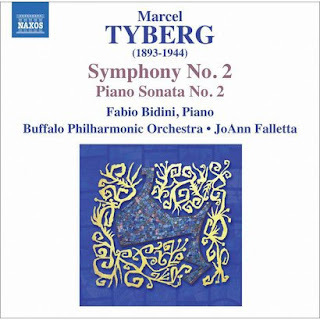 Marcel Tyberg (1893-1944) was a talented but eclectic composer firmly in the Romantic School. He was a holocaust victim. We do well to remember him. He is well served by a recent disk that features his Symphony No. 2 and his Piano Sonata No. 2 (Naxos 8.572822) in excellent performances by Fabio Bidini at the piano and JoAnn Falletta conducting the Buffalo Philharmonic Orchestra. Tyberg's Second Symphony is a full-length, ambitious work that manages to transform yet reflect Bruckner, the Beethoven of the Pastoral Symphony, the Schubert of the Great Symphony and more besides. Yet it does so in ways that put the work in Tyberg's own wheelhouse. Long flowing thematic material has much in the way of invention, seems to be constructed along the lines of long blocks of sonata form, and bears a masterful hand both in the overall trajectory and brilliant romantic orchestration. Falletta and the Buffalo outfit sound well-inspired by the music and the dedicated rendering is infectious. The Second Piano Sonata is most certainly in the grand manner, with influences from Beethoven, Schumann and Liszt showing, yet again all that becoming most certainly Tyberg. Fabio Badini gives us his best, which is impressive indeed. This volume is very worthwhile if you love later 19th-century stylistics. It's definitely a new twist on it all and the performances are inspired. Lieder for voice and guitar are relatively rare in the modern repertoire. Guitarist Volker Niehusmann and tenor Scott Weir have put together a nice collection of them, with Benjamin Britten's song cycles "Folksong Arrangements" and "Songs from the Chinese, op. 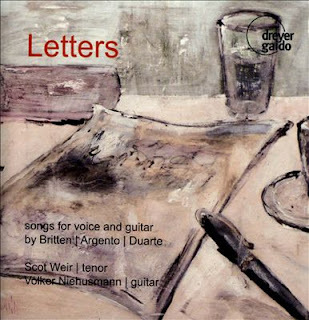 58" and one each by Dominick Argento ("Letters from Composers") and John W. Duarte ("Five Quiet Songs, op. 37). All this on the CD Letters (Dreyer Gaido 21078). Weir has an elocutionally exact, powerful bell-like tenor with the sort of finesse of a Peter Pears. This makes him especially suited for Britten's songs, but no less effective with Argento and Duarte. Niehusmann is impeccable in executing the guitar parts, which necessarily have an accompanying role and do not tend to seek the spotlight. They tend however to be quite artful in construction. The Britten cycles contrast, yet each exemplifies the composer's stylistic concerns--the "Folksong Arrangements" accentuating the rustic old English side Britten spiced his operas with, the "Songs from the Chinese" favoring the abstract declamatory side so prominent in much of his vocal work. They will satisfy the thoroughgoing Brittenite and novice alike. Argento's cycle is most unusual in that it uses as text letters written by Chopin, Mozart, Schubert, Bach, Debussy, Puccini and Schumann. Both it and the Duarte cycle have a straightforward yet contemporary quality that go well with the Britten. All in all this is very well done and rather exotic fare. Britten, guitar and contemporary lieder enthusiasts will have much to savor with the CD. Recommended. The music of Iannis Xenakis was surrounded by controversy when it first came to international attention in the later '50s. He composed via what he called the Stochastic method, which is to say that Stochastic mathematical equations underpinned the musical results he obtained. Nowadays he can be seen as no more heretical than John Cage and his use of chance. Both utilized a system to allow them to conceive of music that would not have been the same had they simply composed in the semi-intuitive way that was and is the norm in music crafting. Both ended up with musics that were most times greatly different than what went before. Xenakis' striking use of an extensive array of non-standard (and standard) sound producing techniques for the string players was a singular element that radicalized the sound of his works for larger ensembles. Interestingly Krzysztof Penderecki came to a string sound (and an overall trajectory) similar to Xenakis when he set about composing a seminal set of works in his early to mid-period. Yet we can presume he composed more in a cognitive-intuitive mode. Be that as it may the two composers very much share affinities and that can especially be seen-heard in their string writing. 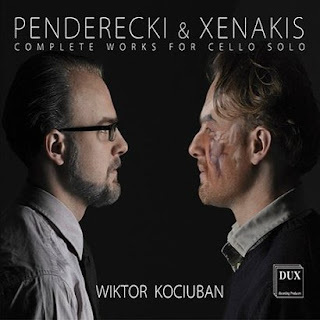 I've been thinking about all this for a while, so when cellist virtuoso Wiktor Kociuban set out to record Penderecki and Xenakis's Complete Works for Cello Solo (Dux 0957) in one CD volume, I was very much ready for it. It has marvelous performances of Penderecki's "Capriccio for Siegfried Palm," Xenakis' "Kottos" and "Nomos alpha," all of which deftly create universes of standard and non-standard cello sounds in all the ways alluded to above, and yet they very much each hang together as music, excellent groundbreaking music for cello. A very substantial bonus comes with the inclusion of later Penderecki solo cello works, most of which are on the more melodic side. They are "Per Slava," "Violincello totale," and the "Suite." These are great to have and Kociuban gives them an expressive cello poeticism wholly appropriate. Kociuban does the music full justice. He has a beautifully rich conventional tone and and at the same time has mastered the difficult expanded techniques of the more avant works, playing those works with a distinct continuity, a phrasing flow that enables the music to come across as totalized, unified utterances and not stitched together sound events that feel like pastiches. Not here. It is a marvelous set of performances and the music still sounds vital. Bravo! Terje Rypdal has been an innovator in every sense from the very beginning of his now long career. An unparalleled electric guitarist, he created his own sound and style, which uncannily incorporated hard rock and psychedelic-avant elements into a very electric setting that had both jazz elements and the sensibility, projection and beautiful tone that is the amped equivalent of a great classical violinist. In his recordings the music could go from an advanced metal trio, to lush post-progressive rock, to free and avant jazz expansions. At the same time he began to write new music/classical compositions that utilized his guitar sound and melodic acuity as the principal solo instrument, in blends that sounded marvelously new, and so they were. 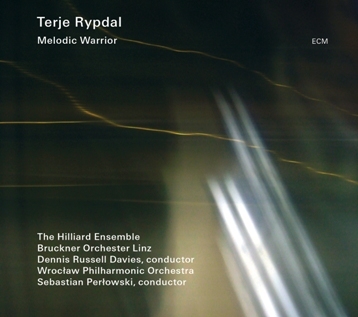 His latest album is an ambitious work for his guitar, the Hilliard Ensemble of vocalists (who bring an early music flavor to the work) plus the Bruckner Orchestra Linz under Dennis Russell Davies or the Wroclaw Philharmonia Orchestra under Sebastian Perloswski. Melodic Warrior (ECM CD B0018730-02) is the resulting album. It is his most impressive work thus far in this zone, in every way spectacular. In reality there are two works represented on the program, but they mesh so well together that they come across as one. There is the title work and there is "And the Sky was Coloured with Waterfalls and Angels," both exceedingly beautiful. Early-style sounds, late-romantic-expressionist-modernism and Rypdal concerto-like guitar lines join together in a pomo kind of narrative where nothing seems out of place. It is a tour-de-force, and will convince anyone who doesn't already know that Maestro Rypdal is as important a composer as he is a guitarist. It satisfies fully and justifies every minute of its existence as a kind of glorious success. For someone who has appreciated the man from the very first album way back, it makes me very happy to hear. Do not miss this! For more or less half my life I associated Labor Day (which is today) with the end of summer and the impending start of the school year. Though it's been many years since I loaded up with books, notebooks, BIC pens and White-Out, and prepared to be enlightened, yet inevitably I still think of school days this time of year. 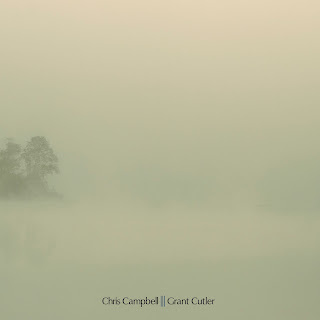 Understandably SchoolDays Over (Innova 862), a 12-inch, 20 minute 45 RPM EP by Chris Campbell and Grant Cutler, does rather hit a nerve with me right now. So what better time to talk about it? 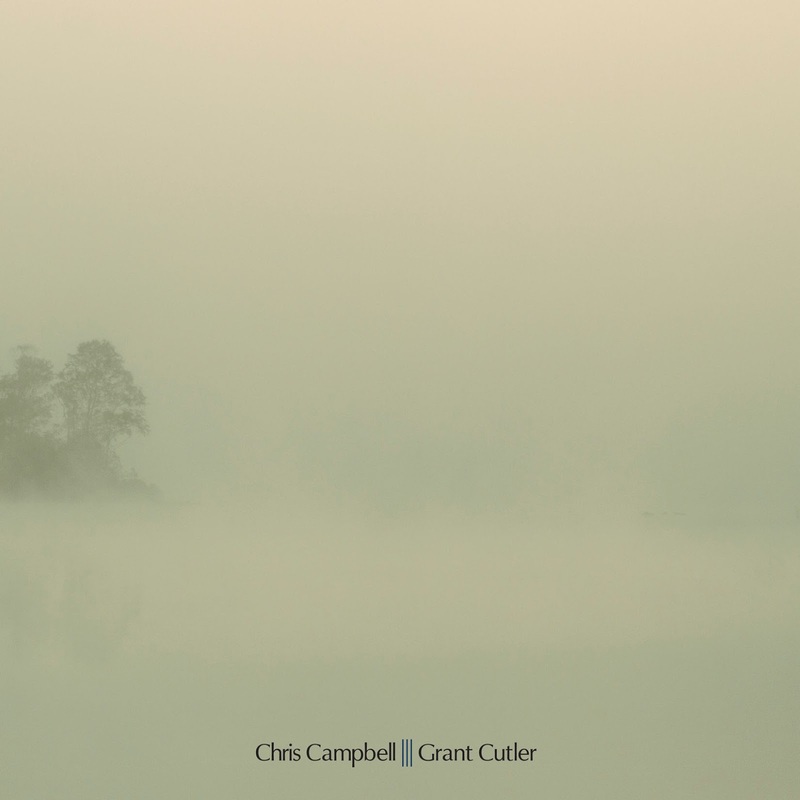 It is one of those that straddles categories beautifully--an art song with a small, soundsculpting-soundscaping, almost minimalist chamber group of piano, cellos, glockenspiel, marimba, synths, pump-organ, gongs, "water bassoons," etc. There are times when there is a pulse and it's quasi-ethnic/minimal. The vocal, song proper of the work comes in three sections with instrumental interludes. There is something there that reminds just a little of Robert Wyatt/early Soft Machine, Jeff Buckley and perhaps Nico-John Cale, but there is no rock feel per se in any obvious sense. It is very evocative, introspective, on the quiet side, magical and appealing--really like nothing else ultimately. It sounds great on analog 45 RPM vinyl! It has much affective about it. Leaving school and entering the work world is never easy and the music has a "remembrance of things past" reflectiveness perfect for the experience of looking back to that moment.